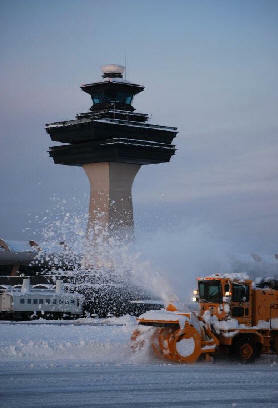 February 10, 2010, It is expected that there will be few flights if any operating at Reagan National Airport and Washington Dulles International as winter storms roll into the area for a second time this week. A winter storm warning has been posted for Wednesday for all area counties. Winds are expected to increase throughout Wednesday afternoon and evening. Blowing and drifting snow will be a concern. Snow may be heavy at times in the morning with visibility one quarter mile or less at times. Total snow accumulation of 8 to 12 inches. Northwest winds 20 to 30 mph with gusts up to 45 mph. Chance of snow near 100 percent. Winter conditions may produce near blizzard conditions at times, Wednesday morning...especially north of Washington DC. In addition a wind advisory may be warranted across the entire area Wednesday and Wednesday evening. A gale warning is in effect for all the waters Wednesday through Thursday. Continental Airways will suspend operations at its New York hub at Newark Liberty International Airport (EWR) on Wednesday, February 10, due to the severe winter weather conditions forecast for the area. Operations at other airports throughout the Northeast and Midwest U.S. will also be affected by severe weather, forcing some delays and cancellations. Travelers with itineraries to, from or through the affected airports through Thursday, Feb. 11, are permitted a date or time change to their itinerary without penalty. If a flight has been canceled, a refund in the original form of payment may be requested. Delta Air Lines will extend the ability for customers whose flight plans may be affected by severe winter weather across the U.S. Mid-Atlantic, Ohio Valley and Northeast to make one-time changes to their travel schedules without fees through Friday, February 12th. The expanded weather advisory encourages customers in 12 states and the District of Columbia to consider postponing or re-routing their travel without penalty to avoid possible inconvenience. JetBlue Airways will suspend the majority of operations to and from the following cities for Wednesday, February 10th due to a forecasted severe winter snowstorm: John F. Kennedy International Airport and LaGuardia in New York City, White Plains/Westchester County Airport and Newark Liberty Airport. Spirit Airlines Initiates Weather Buster Policy - In order to offer customers flexibility, Spirit Airlines has activated and updated its Weather Buster flexible travel protection policy in response to potential flight changes resulting from the current severe weather impacting various airports in the Northeast U.S., including Atlantic City, New York, Boston, and Washington, D.C. For customers holding reservations for travel to, from or through affected locations between Friday, February 5, 2010, and Thursday, February 11, 2010, Spirit Airlines will waive the change fee and difference in fare, provided that customers rebook their travel plans before the date and time of their original reservation, and travel on or before February 13, 2010. United Airlines Issues Travel Waivers - Northeast Waiver Details. The revised ticketing policies apply to all tickets purchased Feb. 8, 2010, or earlier, for travel Feb. 10-11 to, from and through Connecticut, Maine, Massachusetts, New Hampshire, New Jersey, New York, Pennsylvania, Rhode Island, Vermont, Virginia, West Virginia and Washington D.C. on any United, United Express or United code-share flight. Origin and destination cities must remain the same, and rescheduled travel must be completed within seven days of original travel date. Customers with canceled flights are eligible for a full refund. AirTran Airways is extending the travel window for passengers to change their flights without penalty due to an approaching winter weather system expected to bring more snow to the Mid-Atlantic, Midwest and Northeast in the coming days. The Company anticipates that some flight operations may be affected, potentially resulting in flight delays and/or cancellations. Passengers scheduled for travel through February 11, 2010, on AirTran Airways to/from: Chicago (Midway), Detroit, Flint, Mich., Akron-Canton, Columbus, Ohio, Indianapolis, Moline, Ill., and Bloomington, Ind., may change their reservation without penalty as long as travel is completed within five days from the date of the original scheduled departure date, based on space availability without fees or fare adjustments. Passengers scheduled for travel through February 12, 2010, on AirTran Airways to/from: New York (LaGuardia) and White Plains, N.Y., Boston, Allentown, Harrisburg, Pittsburgh and Philadelphia, Pa., Atlantic City, N.J., Baltimore, Md., Washington, D.C. (Reagan National and Dulles), Newport News/Williamsburg and Richmond, Va., may also change their reservation without penalty as long as travel is completed within five days from the date of the original scheduled departure date, based on space availability without fees or fare adjustments. Midwest and Frontier Airlines Travel to or from, through the Northeast, if you are ticketed for travel to, from or through Boston, New York (La Guardia and Newark), Philadelphia, Pittsburgh or Washington, D.C. (National) on Feb. 8-11 and purchased your ticket on or before Feb. 8, Midwest and Frontier will allow a one-time change to your ticket. The administrative change fee and any fare difference will be waived as long as changes are made by midnight, Feb. 11 and the new travel is completed by Feb. 23 (or, due to lack of availability, the next available flight). If you choose to rebook your travel at a later date, the change fee will be waived but any difference in fares will apply. All changes are based on availability. Please note that no changes can be made to the origin or destination cities. Air Canada has revised its ticketing policy for customers booked on affected flights to to the following airports Washington, Reagan National, Washington, DC (DCA), Washington, Dulles, Washington, DC (IAD), Baltimore, International Thurgood Marshall Airport, Maryland (BWI), Philadelphia, Pennsylvania (PHL), New York, LaGuardia, New York (LGA) and New York, Newark, New Jersey (EWR). Those customers wishing to make alternate travel arrangements can do so without penalty, space permitting, using our online rebooking tool: check your alternate travel options currently available; re-book yourself and check in before arriving at the airport. Make alternate travel arrangements if you are travelling on an Aeroplan reward ticket or have purchased an Air Canada Vacations package. Southwest Airlines is monitoring a weather system that is moving across the United States. Based on the storm's path and the forecasted winter conditions, their scheduled service to or from the following airports could be disrupted (delayed, diverted, and/or cancelled) over the next few days. Baltimore (BWI), Boston Logan (BOS), Chicago (Midway) (MDW), Cleveland (CLE), Columbus (CMH), Detroit (DTW), Hartford (BDL), Indianapolis (IND), Long Island (ISP), Milwaukee (MKE), New York (LaGuardia) (LGA), Philadelphia (PHL), Pittsburgh (PIT), Providence (PVD) and Washington (Dulles) (IAD).